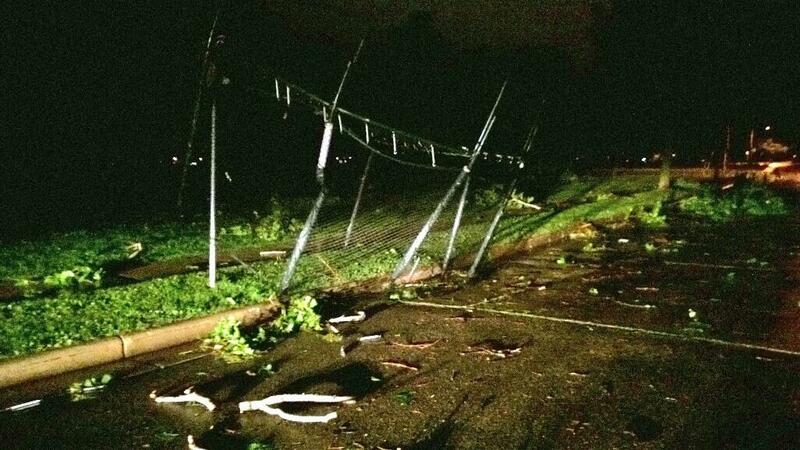 Strong thunderstorms and possibly a tornado visited Madison just after midnight Tuesday. However as daylight reigned, the destruction that befell our deciduous friends that provide our summer shade has become clear. From B.B. Clarke Beach to Olbrich Park the parallel streets closest to Lake Monona saw some of the grandest and stoutest trees snapped or uprooted, some falling on cars or portions of houses. Caffeinated Politics blogger Gregory Humphrey has an excellent photo series of the damage in neighborhood after taking a walking tour at sunrise. He observed the canoe rental racks at B.B. Clarke beach plundered by the winds and many of the trees along the shore had fallen. 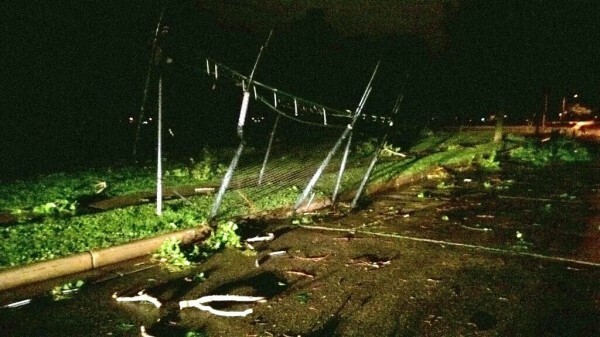 The heaviest damage was reported in Verona and a small pocket on the east end of Schroeder road near the Vitense Golfland. In those areas so far 23 homes have been damaged; some missing roofs. Madison Metro has busses in Verona and the West Side of Madison providing temporary shelter to some displaced residents. “high winds which were preceded with a roar like I have not heard before–five trees down and close to 15 canoes and such water craft on rental slots are all gone as well as the rental units.” Humphrey said in a posting. Madtown Printing on south Baldwin also lost its roof. From both media and twitter postings, especially from @wongofu, numerous downed trees and power lines can be found from B.B. Clarke to Oak Ridge Avenue which is the entire residential stretch of northern Lake Monona. Twitter user @Wongofu reported this backyard trampoline ended up in Yahara Place Park. Marquette Neighborhood Association President Michael Jacob who is also paramedic with the Blooming Grove Fire Department reported on the MNA listserv before sunrise that city crews were already making good progress clearing the streets. 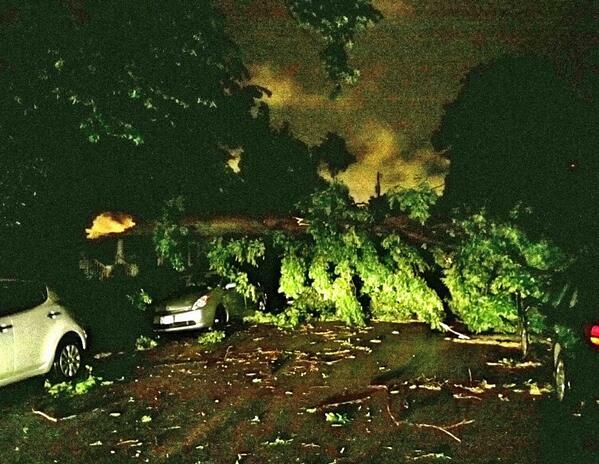 “…the amount of tree and other natural debris strewn across our streets was nothing short of stunning. Much was reasonably tucked to the side by the time I got back,” Jacob said. 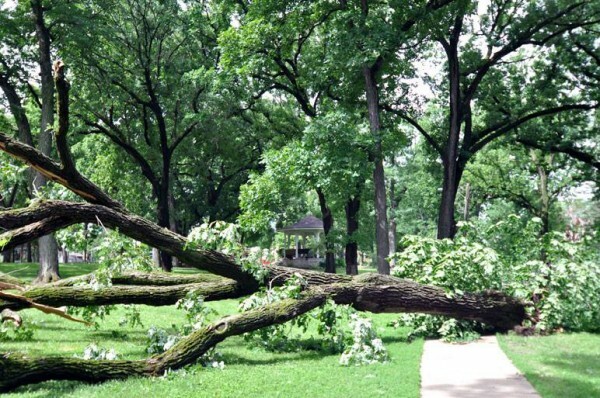 Social media reports, including from Madison Mayor Paul Soglin, showed wind damage in the neighborhood including a traffic light at East Washington Avenue and Ingersoll and a large tree that dragged down power lines in the 1300 block of Jenifer Street behind the Willy Street Co-op. 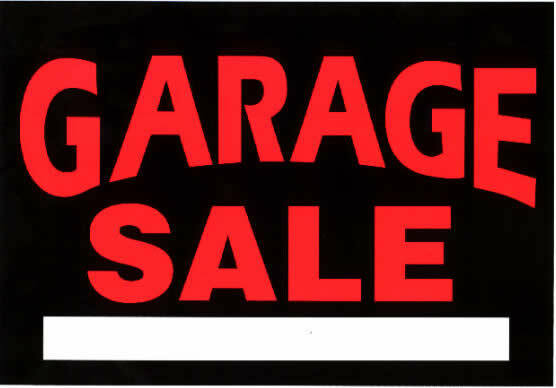 The Marquette Neighborhood Association’s 3rd Annual Neighborhood-wide Garage sale is Saturday June 14, 2014. On person’s junk is another person’s treasure and it seems there will be plenty of opportunities to prove this familiar saying. Over 50 addresses in the Marquette neighborhood and spilling over slightly into the Atwood Neighborhood are registered. 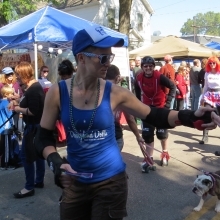 This community event is sponsored by the Marquette Neighborhood Association (MNA). If you are not a member please consider joining. MNA will have a table the Waterfront Festival (June 7th and 8th) and Orton Park Festival (August 21st – 24th) – membership is only $5. Despite a downpour Saturday evening that cut short the set by Lyrics Born, the 2014 Marquette Waterfront Festival was a thrilling success. 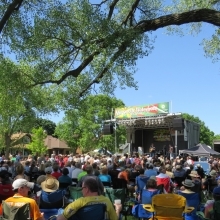 Strong attendance both days was driven by excellent weather and deft booking by lead organizer Bob Queen who along with Nancy Kathman were honored Saturday “For bringing music to our neighborhood”. See below for scenes from Sunday at the festival. 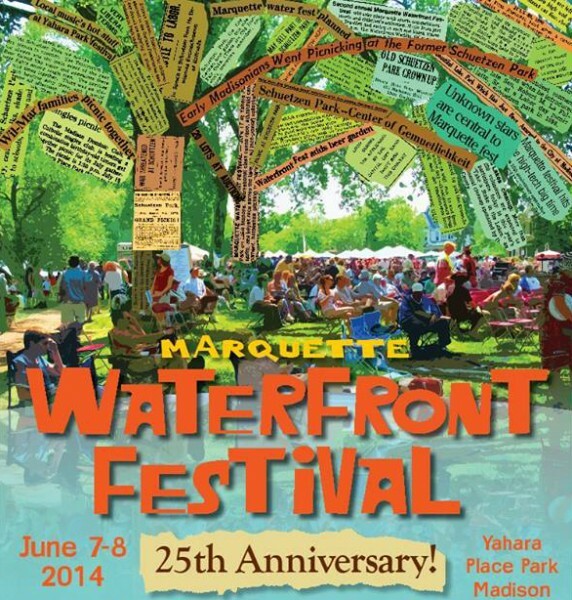 The Marquette Waterfront Festival (June 7-8) is twenty five years-old this year and while not the youngest neighborhood gathering it has the special role of heralding the beginning of summer. Just a day or two following the end of the school year for area children, it is the perfect weekend celebration for families which was the original intent of the event when it began in 1990. 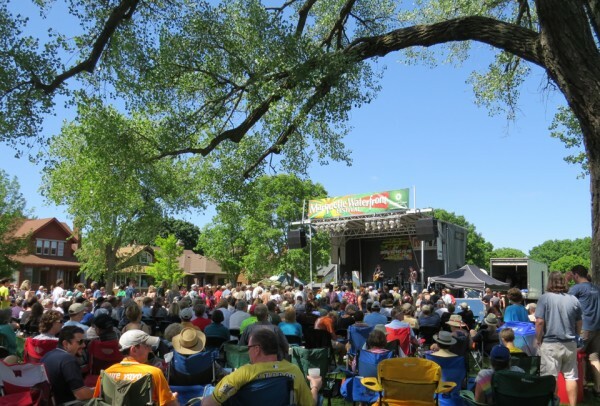 The festival was born during an all-out effort to prevent the possible closing of Marquette Elementary school and other potential neighborhood elitism that was starting to bubble up on the east end of the Marquette neighborhood. While much attention seems to be focused in the Willy Street area, our neighborhood does stretch all the way to Division street, encompassing sleepy and pleasant streets between Eastwood drive and Lake Monona. It was at Yahara Place Park, a quiet strip of land where people mostly just gaze at the lake, that parent Bob Queen and others plotted their neighborhood comeback.